I have always loved making summer rolls for family gatherings because they are fresh, easy, and healthy. There is also a lot of room to improvise with your favorite summer veggies. This recipe is vegetarian, but you could easily use shrimp, pork, or chicken along with the vegetables. These are also fun to make with kids. They can easily help with washing, tearing herbs, handing you ingredients or placing them in the summer rolls. My nine-year old and I had an assembly line of ingredients, and we had them done in no time! Then we had some of our Tiny Tasters over for dinner and swimming and let them try our creation. 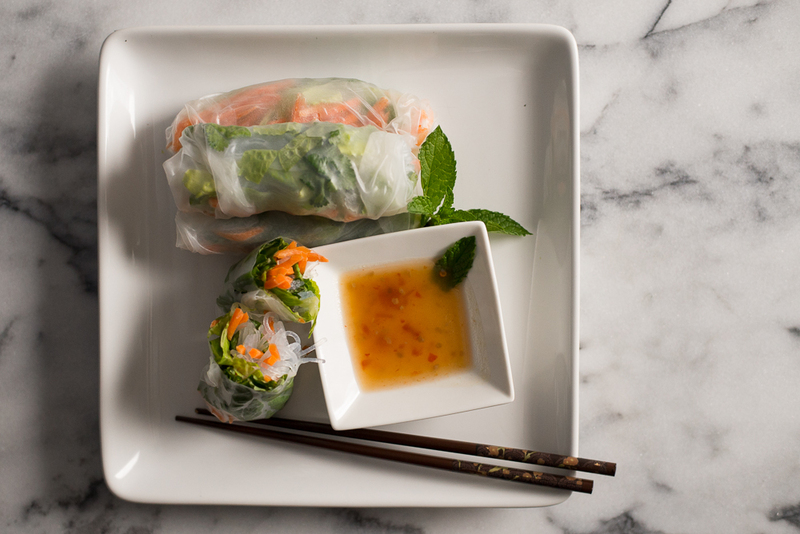 Summer rolls can be served with all kinds of premade or homemade sauces. We found a great “Sweet Chili Sauce” in the Asian section of Wegman’s Grocery Store (their own store brand), which was perfect. Place bean threads in a bowl and pour boiling water over it to cover. Soak for 10-15 minutes until softened, then drain. Use a wet kitchen towel or wet paper towels to assemble the rolls. Keep another kettle of hot water ready to prepare your rice papers. In a shallow pie plate pour hot water and the place rice paper 1-2 at a time in the water to soften for about 1 minute. Once soft remove and place on your wet towel, flattening out the best you can (it will be like wet-tissue paper, so careful not to tear. Place a stack of veggies that takes up about about 2 x 4 inches centered on the rice paper, including 1 -2 small lettuce leaves, 2-4 basil leaves, 2-4 mint leaves, small sprig of cilantro, and 1-2 tsp. shredded carrot. Place a pinch of these the bean threads on top of your veggie pile. Fold the top and bottom over the pile. Then fold the right side over the pile and begin to roll the summer roll like a log until the left free edge covers up and seals the entire roll. Cut in half before serving. For best results eat soon after preparing, or store for a short time covered with a slightly damp paper towel. Dip in your favorite sauce.